Due to the extremely hot weather, we have had to make some changes to what was originally arranged for Len’s Challenge. Today, the team managed to walk around 9 of the planned 13 miles over the Shropshire Hills but had to stop because of the weather. We understand that there are some concerns regarding access to drinking water and the ability to carry enough water to stay hydrated in this weather. We have also taken advice from experience walkers, medics, and the Offa’s Dyke Trail officer about the safety of those walking and their risk of heatstroke, dehydration, and severe blistering. 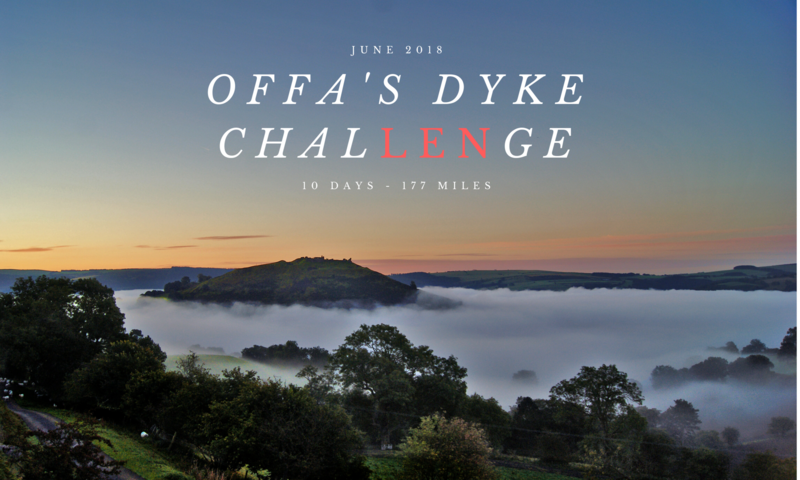 From our understanding, there are very few points on the Offa’s Dyke path that are accessible via the support vehicle, so it will not be available to deliver water on route. Individuals are required to assess their own level of fitness and the amount of water they’re able to carry. However, because of the weather, we’re going to try and make the walks more accessible and safer for those taking part. For this reason, Len and the team have taken the decision to shorten the lengths of the walk for the following days. We have worked closely with the Offa’s Dyke Trail officer to find the most appropriate revised stopping points in terms of the length of the walk and the available car parking facilities at the finish line. The start times and locations will remain unchanged. Please see the proposed end points below. If you choose to carry on and walk to the originally-proposed end points, you do so at your own risk. Please note that current forecasts anticipate that the weather may be cooler by Monday and much of the trail is through woodland that day so we’re hoping that we’ll be doing the full walk, ending at the Sedbury Cliffs south of Chepstow. Please also bring some insect repellent as the team today have been bitten numerous times by horseflies. However, levels of insects may be different in different areas. Continue to monitor our social media channels and the website for updates. We’re sorry for any inconvenience cause but the safety of our walkers is our priority. Len and the team have taken advice from experienced walkers and medics on the weather conditions. On the basis of this advice and with temperatures reaching 30 degrees, we will be continuing the challenge but at reduced miles each day as a precaution. We must ensure the challenge is safe and people who are walking it don’t suffer from dehydration or heat exhaustion. The start times will remain the same at the same locations and a judgement will be made each day on how far to go, we estimate around five miles. We apologise for any inconvenience this will because but we must put safety first. Please read our previous post about preparing for walking in the hot weather. Please monitor the website or social media for updates. Due to the extremely hot weather, which has seen temperatures exceed 28°C before midday on the Offa’s Dyke Path, we are taking all necessary precautions to make sure all walkers are made safe in the sun, as there is very little shade on the path in many places. Before undertaking this challenge, we knew it was going to be extremely difficult but the very high temperatures have made it even more so than originally anticipated. Our aim is to ensure that the walk is a pleasant, albeit challenging, experience and that our walkers are not put at an increased risk of heatstroke or dehydration. So far, walkers have been drinking between 3 and 5 litres of water daily, wearing factor 50 sun cream, and wearing appropriate headwear which shades the face and neck. 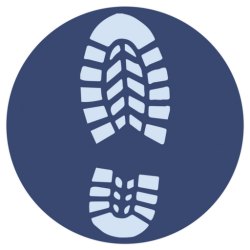 It is also recommended that walkers prepare adequately to minimise the risk of developing blisters as the heat will cause your feet to swell, sweat and rub on your boots. We recommend spare pairs of socks to change into to avoid wearing wet pairs for too long, as well as plasters/tape preemptively applied to areas which you know are prone to blistering. As the Met Office is predicting that temperatures will continue to rise for the rest of the week, this may mean that we have to make adjustments to timings and distances of the remaining days in order to ensure everyone’s safety. We’ll be sure to let you know of any changes that will be made as a result of the weather. This weekend, the weather was beautiful. It is really starting to feel like Spring and South Wales is truly beautiful this time of year when the sun and the daffodils are out. I’m lucky to live fairly near to Caerphilly Mountain so while the sun was shining and with 90 days to go until the start of the challenge, I thought it would be a perfect day for a hike. It was a 13km round trip, which took me just over 2 hours. I have to say, I really enjoyed it and I feel like my outdoor distance training is beginning in earnest! I’ve also started walking to and from work, which I am also thoroughly enjoying. Switching from your car to walking/cycling to work is a great way to get extra training in around a busy work schedule. It also helps to reduce your carbon emissions so, for me, it’s a win-win situation! I started my training in earnest this weekend. I am a member of the Village Hotel Gym and I spent two hours there on Saturday afternoon and a further 1.5 hours on Sunday. On Saturday, I spent the time on the Cross- trainer for 90 mins and a further 30 mins on the fixed bike. To be honest, I find gym work quite boring but it was so cold outside, I think the gym is a good alternative. I spent my time watching the England vs Scotland 6 Nations game which was also bittersweet, but well done to Scotland! On Sunday, I spent the whole 90 mins on the cross-trainer whilst I watched the Manchester United game against Chelsea. It may surprise some, but I am not a fan of Man Utd, and so their win against Chelsea was equally disappointing. All in all a good weekend of training but the sports results were not to my liking. With only 16 weeks to go, I know the day I set off from Prestatyn will be here in a heartbeat. Good luck to everyone else who’s starting to train for the challenge.